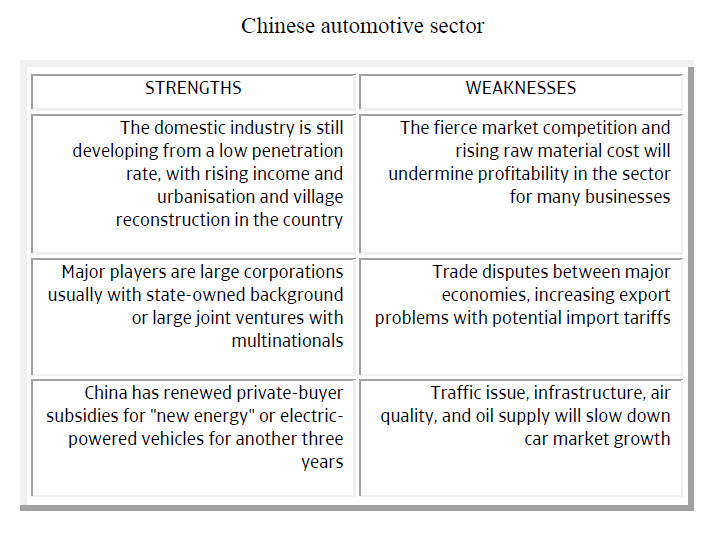 Although China ́s economic growth is forecast to slow down in 2014, there are many positive catalysts for the car industry , and we expect a second straight year of strong growth. According to the China Association of Automobile Manufacturers (CAAM), Chinese car production increased 15% in 2013, to 22.1 million units. Vehicle sales increased 13.9% year-on-year to 21.98 million units in 2013 , more than in any other country. Passenger car sales increased 15.71% and commercial vehicle sales reached 4 million units, up 6.4% year-on-year and reversing a downward trend. Although China´s economic growth slowed in 2013, to 7.7%, and another slowdown to 7.5% is forecast for 2014, there are many positive catalysts for the car industry , and we expect a second straight year of strong growth in 2014. China’s auto industry sales were robust during the first half of the year. Passenger car sales increased 11%, to 9.6 million units, as consumers continued to flock to dealerships. However, the economic slowdown had an impact on the commercial vehicle market, with truck sales down 4% to 1.8 million units, due mainly to lower construction activity. Bus sales increased 4%, to around 300,000 units. Overall, in the first half of the year total vehicle sales increased 8%, to 11.7 million units. As the world's biggest auto market, China is likely to sustain the momentum it regained in 2013, helped by the anticipated economic stimulus measures and robust demand for cars in the smaller cities of China's interior regions. China’s auto market still has plenty of growth potential. Relative to population, car ownership is low, with about 120 million vehicles on the roads in a country of 1.4 billion. That equates to fewer than 100 cars for every 1,000 people: far lower than in Europe and Japan where there are 600 vehicles for every 1,000 people. Economic growth in the interior provinces, new stimulus measures, rising household incomes and falling vehicle prices will all help ensure a second straight year of robust growth in the passenger car segment. rapidly, with an estimated average growth rate of around 10% in 2014-2017. In 2013, the sales volume of new cars in China accounted for 80.9% of Chinese car dealers’ total sales of both new and used vehicles. New car sales represented more than 85% of dealers’ total revenue. In comparison, in America over the same period the sales volume of new cars sales made up just 27.6% of the total accounting for 57.1% of dealers’ total revenue. Last year, China's auto after-sales service sector accounted for a small proportion of revenue, (less than 12%), but made a larger contribution to gross profit (above 45%). In future, with a slowdown in the growth of the automotive market and the declining before-sales profit on vehicles, we expect carmakers and dealers to shift their focus to developing the automotive aftermarket. Meanwhile, as private car ownership surges and car owners' perception of upkeep shifts to ‘car maintenance’ from ‘car repair’, the automotive aftermarket, which has shown great potential, can start a period of development. Payments in the Chinese automotive industry take 90 day on average, but we expect longer payment times in the future because of liquidity pressures on suppliers. Payment defaults in the automotive sector are on a par with other Chinese industries and automotive businesses in general will see their profitability hit by more intense competition. 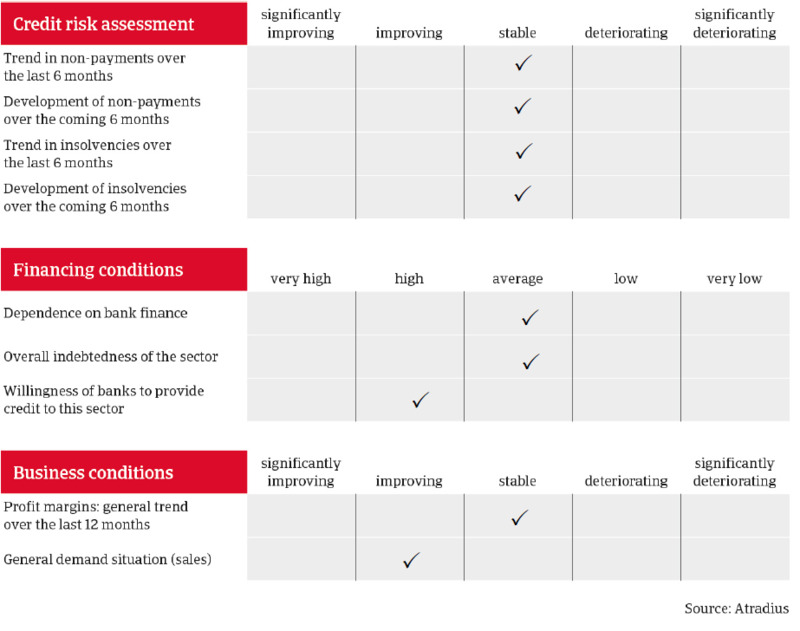 However, we do not expect any significant increases in payment delays or insolvencies in the coming months. Our underwriting stance towards manufacturers remains generally open. We view auto manufacturers as strong businesses, because of the sector’s capital and technical intensity and the growth potential of the Chinese car market. However, we are more cautious towards manufacturers of domestic brands than joint ventures, and focus more attention on companies involved in ’new energy’ or electric-powered vehicles. In all cases, we look mainly at cash flow and profitability when considering applications for cover. Core parts manufacturers (engines and related equipment) usually have high Research & Development costs (often accounting for more than 65% of net profits) and therefore, when assessing their creditworthiness, we tend to focus on their own financials. For players in the non-core parts segment (lights, seats, axles, tyres etc.) we focus on whether they are overly export-oriented, in view of ongoing anti-dumping policies against Chinese enterprises that can lead to import barriers. We take extra care with smaller companies in the car parts supplier segment: they will come under particular pressure because of their poor equity strength, which could give rise to insolvencies. Unlike manufacturers, businesses in this segment may have difficulty obtaining bank finance. In the car dealer segment we are seeing increasingly fierce competition between ‘4S’ stores (Sales, Service, Spares and Surveys) and therefore, when assessing their credit risks, we consider changes in stock levels in 2012 and 2013, cash flow and the rationale for any expansion of their business.